Do you ever go to the grocery store or farmers’ market and pick up something new? Sure, there are always things that are different from what you usually buy, but you are used to seeing – and ignoring – them. It’s a routine: pick up the same items from the same places on the same shelves, never noticing what else is around. At the grocery store I pass by the pet food because we have no pets; though it’s there, in my periphery, I don’t really pay attention to it. I never buy it. That used to be the case for broccoli. Growing up, we didn’t have broccoli. I’m sure I had it some where, some time, but it wasn’t in regular rotation at home. But years ago I noticed broccoli at the grocery store and bought a head. And it turns out my oldest son likes broccoli. So I started buying it regularly, usually steaming it very briefly, then adding a squeeze of lemon and a sprinkling of salt. These days we often have it in soup with long bean-thread noodles, mushrooms and soy sauce, or in a pasta dish with raisins and garlic. Broccoli is in regular rotation. Now I often notice different things at the store. And when the summer’s bounty is bursting from the market, I always buy new fruits and vegetables. I don’t want to be stuck in a rut. This fall I bought 2 varieties of peppers. 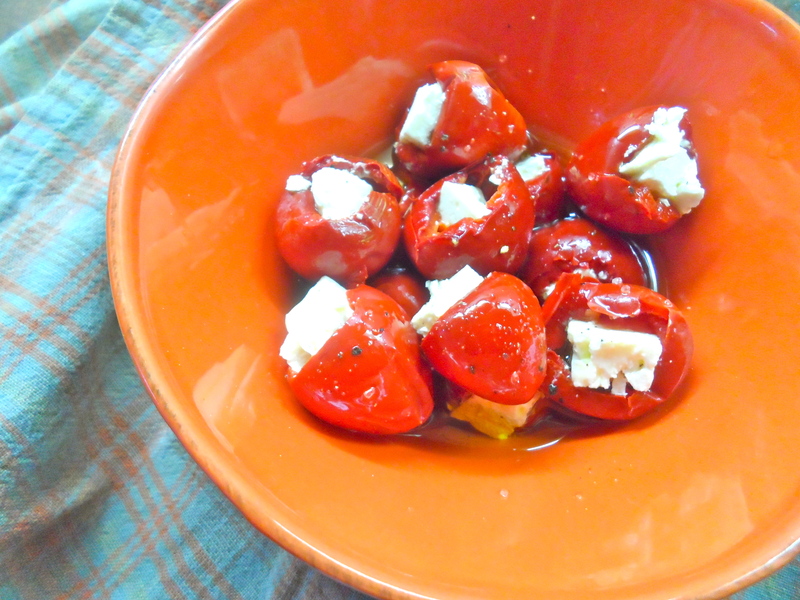 The tomato peppers were startling: they look just like tomatoes, in pepper shades. I’d never had them or seen them before. 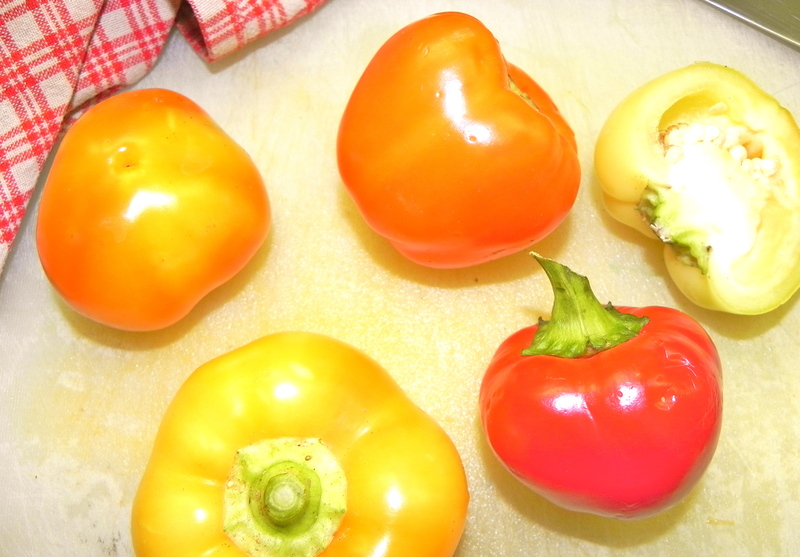 They tasted much like bell peppers so I made a sort-of cacciatore sauce from them. Served as a pasta dinner, that was that. 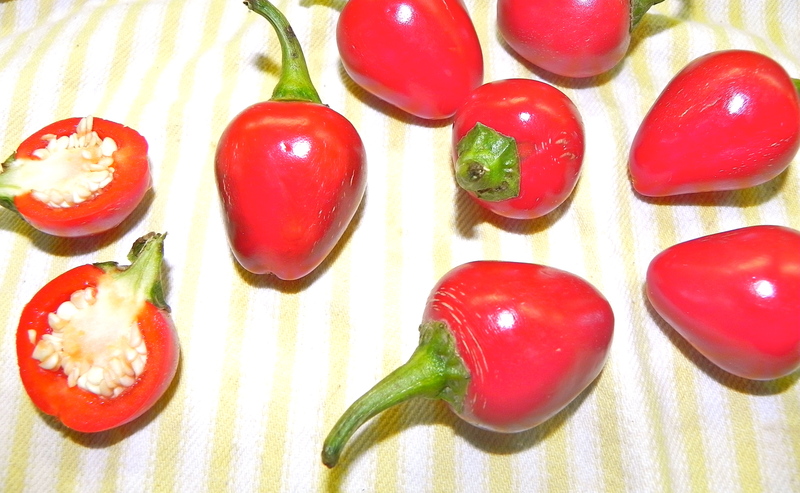 Cherry peppers are often in a jar at the store. The tend to be spicy, in varying levels, but these were not. 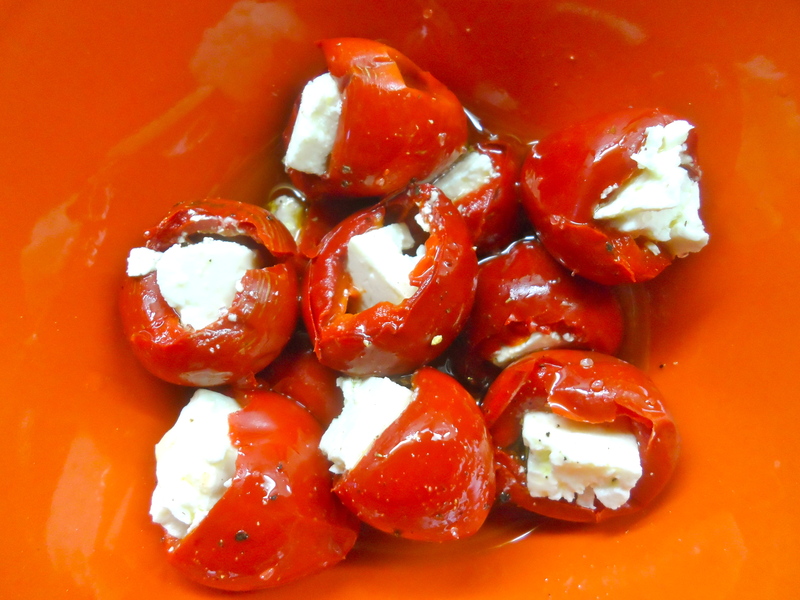 I stuffed the red beauties with feta cheese, and poured some infused olive oil over them to marinate until dinner. But that’s it. So simple, so delicious, and so… finished at the end of the meal. Look out for different things at the market, especially produce that you might not get a chance to pick up next week. Peaches aren’t the only seasonal treats to wait all year for!